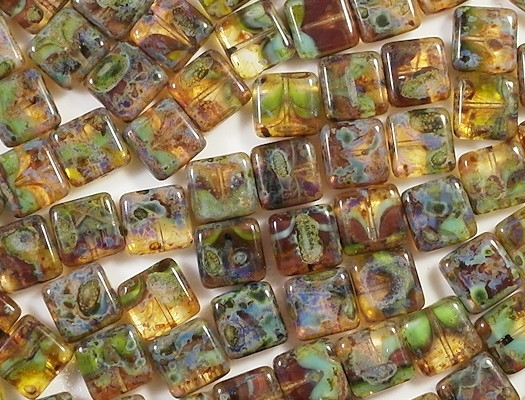 10mm (long) x 10.5mm (wide) x 5mm (thick) squares. It's hard to see what's going on under the picasso coating, but I think the beads are translucent light topaz with v-shaped stripes of opaque aqua and dark red (but don't aske me to swear to that). The picasso coating is multicolored and very attractive. 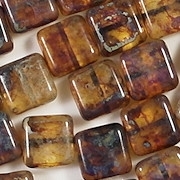 I discovered while photographing the beads that some are cracked, so I will be inspecting them all to eliminate the cracked beads. 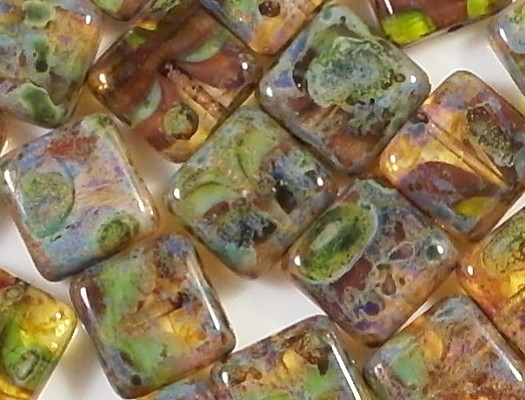 Some beads also have a pit. 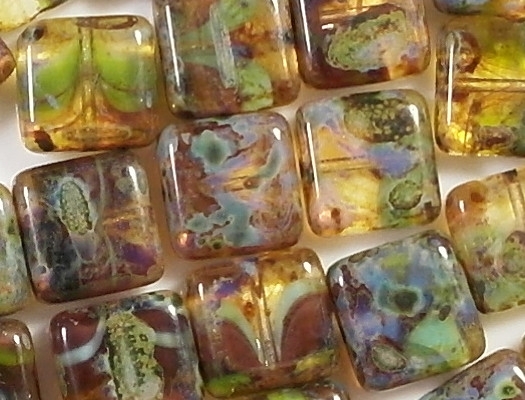 Whether or not I discard pitted beads depends on whether the pit is very small or larger. 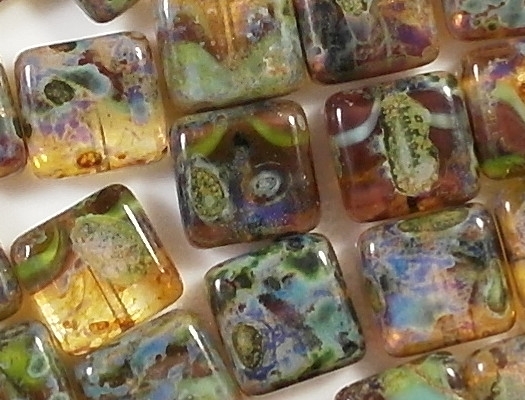 The appearance of these beads is so complex that no one would notice a small pit in the surface. All beads that have two ore more pits will be discarded. Please note that picasso coatings are generally durable, but they are not all applied by the same method, and some coatings may be less durable than others. 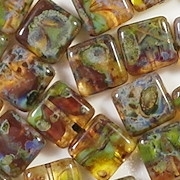 Since some of these beads have defects, I scraped a couple defective beads with a knife, and no picasso coating came off. Between two daylight-balanced lamps. I took new pictures in December, 2016. 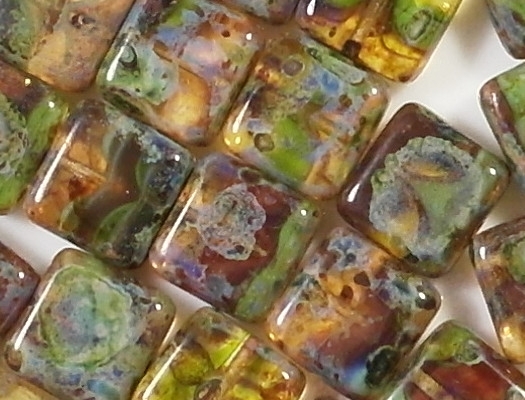 Important: The photo shows these beads on a white surface under very bright lights. In low light, or against dark materials, they will not look so colorful. If you wear the beads against a light-colored blouse or dress, and you wear them in the sun or under bright lights, the colors will really pop. 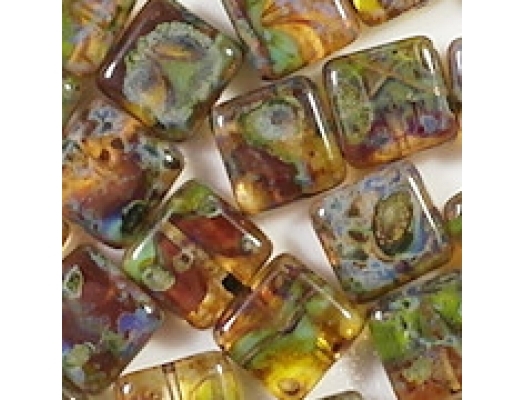 NOTE: These beads are essentially the same as the G1733 beads except that these beads have more blue and green color in the picasso coating.